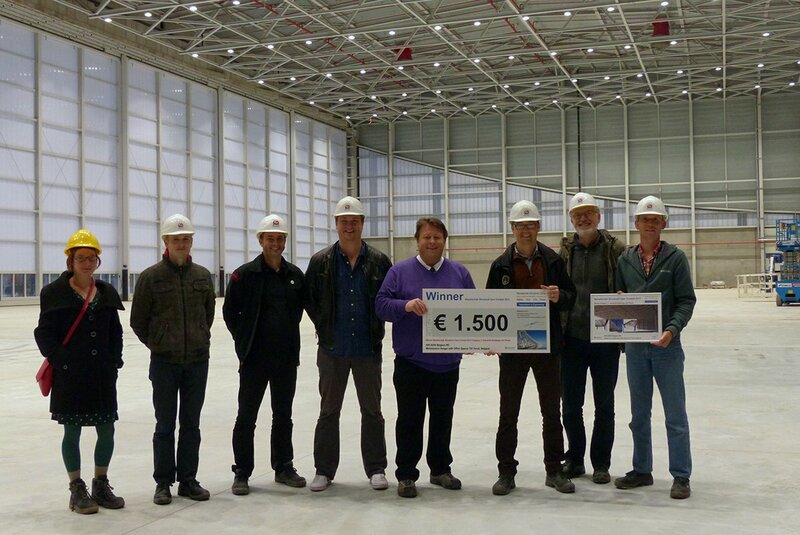 At this time at the Zaventem airport in Belgium, where hall number 40 stood before, a new building is being built. 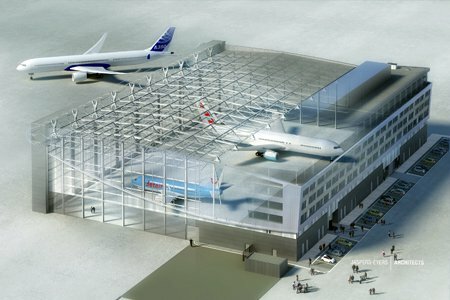 The owner, TUI Travel Belgium, named the modern structure “Jetairport”. The new maintenance complex includes a hangar with a ground area of 10.000 m² and, in total, additional 11.500 m² of office space. In order to accommodate different aeroplane types at the same time, including the brand-new Boeing 747 Dreamliner, it was necessary that a minimum span length is ensured at the entrance. 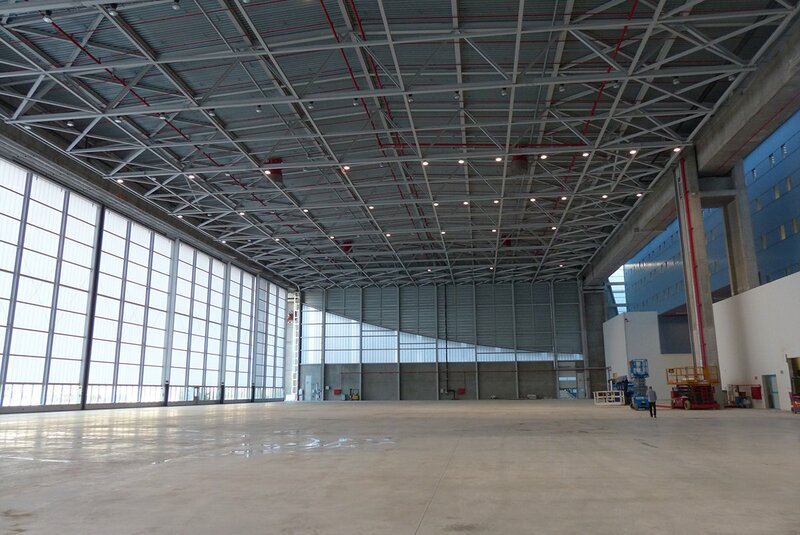 The hangar has a clear span of 112 m and a clear height of 20 m below the rafters. The office section includes a basement floor, six above-ground storeys and a technical floor. It can seat 1000 employees. The hall is 117 m wide and 55 m long. Because no intermediate columns could be provided at the front façade, a span of 112 m had to be achieved there. To solve this problem, a post-tensioned concrete box girder was employed; the box section is 3 m in width and 6.5 m in height. At the back side of the hall, it was possible to add an internal column. 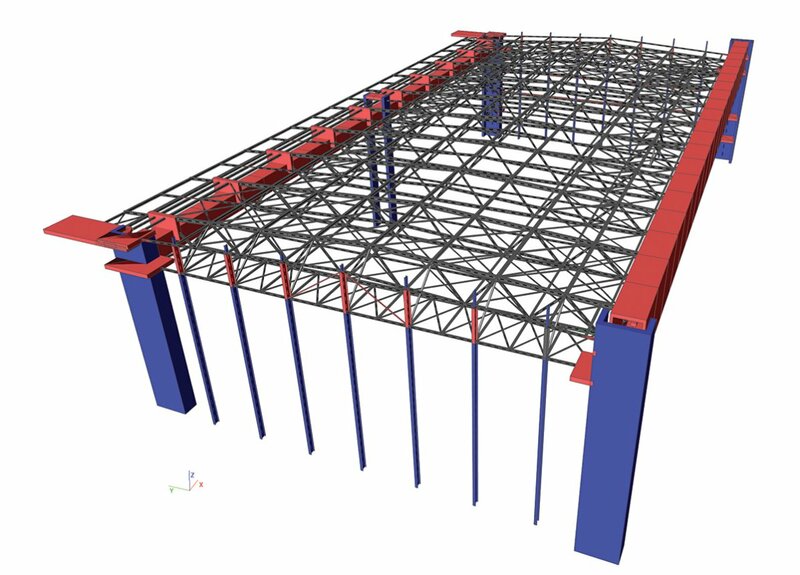 It was used for a continuous box girder on three supports; this post-tensioned girder has a width of 2.5 m and a height of 2.5 m.
Perpendicular to the two main girders is a steel roof structure, consisting of 10 lattice girders (Warren type truss) of variable height. 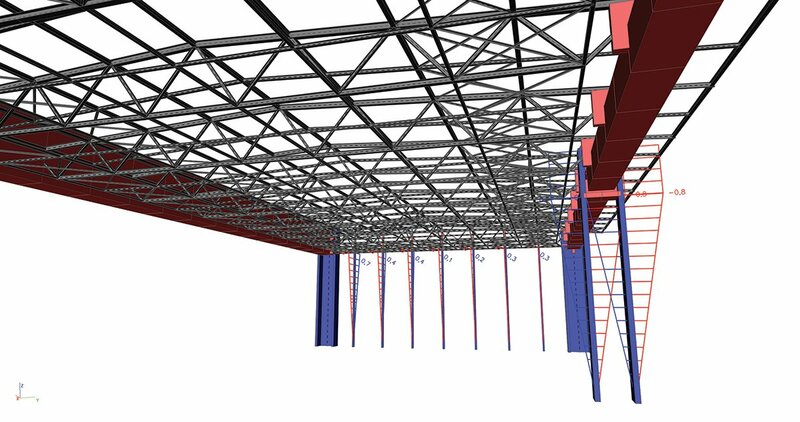 The height at the middle of the truss span is 5 m. The necessary purlins and wind bracing are provided between the frame elements. The whole roof structure is supported on five concrete U-shaped columns with the height of 26 m.
The office segment is 112 m long and 21 m wide. Since the erection speed was of paramount importance, all building parts were conceptualised and designed as prefabricated. Columns were manufactured as two segments with length 14 m; these spans over 3 floor heights. Haunches are provided on either two, or three sides. On the columns, prefab-beams are laid, which bear their own weight and serve as support for the pre-stressed hollow-core concrete slabs that form the floors. After grouting the reinforced top layer of the slabs, the horizontal diaphragm action was ensured and lateral loads could be transferred to the central cores. The office section is divided from the hall by a firewall with 2 hour fire resistance. The hall roof assembly process requires further attention. The two main concrete girders were cast on-site on the ground. After the girders gained sufficient hardness, the post-tentioning was introduced. Due to time constraints, the steel structure was assembled simultaneously also on the ground, between the two main concrete girders. In the mean time, the five main columns were joined on-site. Subsequently, in a matter of hours the whole roof, with a total weight of 3,000 tons, was lifted to the height of 20 m, by means of hydraulic jacks. A short video of the lifting process can be found at http://youtu.be/eSb9CsIuMvI.